Bolle 11418 11418 Helix Shiny Black - Polarized TNS Sunglasses FREE SHIPPING! Designed for cyclists and runners, the polarized Helix Shiny Black Sunglasses from BOLLE are ideal for high-intensity wear. A sporty fit feels secure against the face and will not come loose during aggressive physical activity. Performance frames and precision-molded lenses match the natural contours of the eyes and face, cutting through high speed winds with ease. True neutral smoke (TNS) lenses are neutrally colored to provide undistorted color perception, reduce eye fatigue and minimize glare. Polarized to protect the eyes against damaging UV rays, these glasses are as functional as they are stylish. 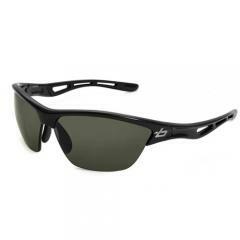 ©2002-2019 CopsPlus.com: Bolle 11418 11418 Helix Shiny Black - Polarized TNS Sunglasses FREE SHIPPING!